2009 AHL All-Star Classic Voting; Which Amerk Should Represent the team? · Let's Go Amerks! 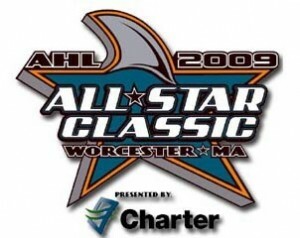 2009 AHL All-Star Classic Voting; Which Amerk Should Represent the team? Fans will have the opportunity to vote for the most deserving AHL players by visiting theahl.com and completing the official Reebok AHL All-Star Fan Ballot. The players receiving the most votes by position will earn berths in the starting lineups of both the Canadian AHL All-Star team and the PlanetUSA AHL All-Star team at the 2009 AHL All-Star Classic presented by Charter Communications, to be held Jan. 25-26 in Worcester, Mass. A committee of AHL coaches will select the remaining All-Stars, and all 29 clubs will be represented on the final rosters. Which raises the question, who from the Rochester Americans should be represented at this years All-Star Classic? The top two choices at this point would be Michal Repik, Janis Sprukts, or Jason Garrison. Repik would probably be the top choice since he currently leads the team with 14 points (6 goals, 8 assists). Janis Sprukts isn’t too far behind with 10 points (4 goals, 6 assists). Depending on the rest of the roster, if they’re short on defense the pick would go to Jason Garrison. He has 10 points as well (2 goals, 8 assists). He’s currently ranked 38th amongst defenseman in scoring, and his -14 rating probably won’t work in his favor. So, who do you think should represent the Amerks at the 2009 AHL All-Star Classic? Clarke MacArthur had been picked last season to represent the Amerks but was replaced by Mark Mancari. MacArthur was called up to the Sabres at the time of the game. That worked out in favor of Mancari who entered the record books and Hockey Hall of Fame with his hardest shot in the skills competition. We have our tickets for the festivities already, hopefully others are as well so we’re not the only two fans cheering on our player(s).